US players have captured the first five bracelets of the 2012 World Series of Poker but an Aussie is staking a claim to break the drought for the internationals. Sydney’s Warwick Mirzikinian is the chip leader with 31 players remaining in Event #6, the $5000 No-Limit Hold’em Mixed Max. Under the unique format of this event, play started nine-handed and moved to six-handed on day two. The remainder of the tournament will be played heads-up. As chip leader, Mirzikinian earned a round one bye but faces tough line-up in the run to the gold with notables still in contention including John Hennigan, Joseph Cheong, Marvin Rettenmaier, Brian Rast, Adam Geyer, Brock Parker, Joe Tehan, Eric Froehlich and Victor Ramdin. • “First the ring, then the bracelet” – that’s the motto on the World Series of Poker Circuit, which encouraged poker players to compete in various events around the country, which are spread out over the nine months when the WSOP "big one" is dormant. Nick Jivkov, a 34-year-old semi-pro poker player and business owner from Des Plaines, IL took the slogan literally. 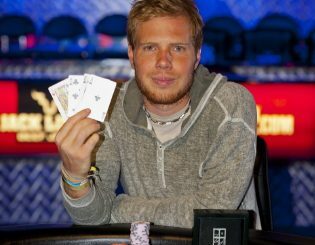 He cashed 10 times in various WSOP Circuit events around the country during the last few years, ultimately winning a gold ring in 2010 at the IP in Biloxi. He now owns a WSOP gold bracelet after taking out Event #5, the $1500 Pot Limit Hold’em title and a first prize of USD $189,818. By the time Daniel Negreanu had been KOed in fifth place, Jivkov held 60 per cent of the chips in play. Runner-up Bryan Pellegrino drew level at one point but Jivkov would not be denied. • The first major tournament record to fall at this year’s WSOP was attendance for Event #8, the $1500 buy-in Omaha High-Low Split event. A whopping 967 players packed the Rio Las Vegas, crushing the previous record number set at last year’s WSOP when a then-record 925 bodies showed up for an identical event. This makes Event #8 the largest live Omaha High-Low Split tournament in poker history. • Another bracelet will be decided today when the final nine players in Event #7, the $1500 Seven-Card Stud tournament return to the felt. The loaded final table is headed by David Williams while Barry Greenstein and Andy Bloch also remain in contention for this title, which carries with it a payout of USD $126,363. A second highlight of the day is the first repechage event in WSOP history. Event #9 is the $1500 buy-in No Limit Hold’em (Re-entry) tournament, a format well known to players in Australia. Those eliminated in today’s first flight have the option of re-entering on day 1B before the field combines for day 2. • While the blood pressure of many of his contemporaries reaches a boiling point and the poker world gets rocked to its core by younger upstarts, mostly in their 20s and 30s, 65-year-old Chris Bjorin continues to play the best poker of his life, demonstrated by a stellar record in gold bracelet events over the past four years. Bjorin’s second-place finish in Event #4 gives him eight final table appearances since the start of the 2009 WSOP, which ranks among the best performers in the game for that time span. The Swedish-born Englishman has won two gold bracelets (1997 and 2000) with two runner-up finishes since the middle of last year’s series. Bjorin has now cashed 20 of the last 21 years. His 62 cashes ranks fifth on the all-time list, placing him the game’s most hallowed company. He’s also cashed in three of the last four WSOP Main Event Championships.